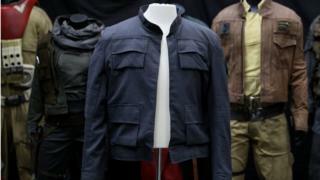 The jacket worn by Harrison Ford when he played Han Solo in Star Wars' The Empire Strikes Back is expected to fetch up to £1m at auction next month. The garment is one of 600 lots going under the hammer at the movie memorabilia event in London. Marty McFly's Back To The Future Part II hoverboard and Johnny Depp's Edward Scissorhands costume are also on sale. Auction house Prop Store said the sale would include "some of the most iconic cinematic artefacts of our time". Star Wars fans will also be able to bid for a Stormtrooper helmet from A New Hope, which is expected to fetch up to £60,000. A similar helmet from the most recent film, The Last Jedi, could raise up to £50,000, the auction house said - with profits from that going to charity the NSPCC. A lightsaber wielded by Hayden Christensen's Anakin Skywalker in Revenge Of The Sith is likely to draw bids of up to £100,000. In June, a blaster used by Ford in Return of the Jedi sold at auction in New York for $550,000 (£415,000). The upcoming auction will be held at the BFI Imax in London, where the items will be on display for the public to view from 6 September to 20 September. Prop Store said the whip used by Ford in Indiana Jones and The Temple Of Doom is poised to sell for between £50,000 and £70,000, while his fedora from The Raiders Of The Lost Ark is expected to sell for between £200,000 and £300,000. Other film items up for sale include the robe worn by Brad Pitt as Tyler Durden in Fight Club, as well as Forrest Gump's Bubba Gump Shrimp hat, worn by Tom Hanks. Alongside Depp's Edward Scissorhands clothing will be other costumes including the Superman outfit worn by Christopher Reeve and the outfit worn by Spike in Michael Jackson's 1988 film Moonwalker.